All Ages & Levels Hip Hop Class, followed by the super popular Parent Jam! Parents and family members - now it is your turn to take class with your dancer! All Ages & Levels are welcome! Please note that material for the Master Class will be taught at an Int/Adv Level. ONLINE Registration is Closed. Walk Ins are welcome for the at the door pricing. Thanks! Please CLICK HERE to review the terms and conditions waiver prior to reserving your spot. If under the age of 18, parental consent is strictly required. Come take class from one of the industries top working choreographer to the stars! Online Registration is Closed. Walk Ins Are Welcome. ONLINE REGISTRATION IS CLOSED. WALK INS ARE WELCOME & CASH ONLY AT THE DOOR! Monday, February 18 - President’s Day Master Classes with Brian Esperon! Please Note: Both Classes are open to All Ages and Levels! Come dance with us! ONLINE REGISTRATION IS CLOSED - WALK INS ARE WELCOME!!! ALL PAYMENTS MUST BE MADE WITH CASH AT THE DOOR. All Ages & Levels are welcome! Join us for 2 Hip Hop Master Classes on Columbus Day! Ysabelle from LA and Kenny Clutch from NJ are coming to BRING THE HEAT! Phil Wright Master Class + Parent Jam! Parents and their children are $15 (for the family) to participate - now it is your turn to take class with your dancer or on your own! All Ages & Levels are welcome! Please note that material will be taught at an Int/Adv Level. Pre- Registration is closed, but there are still spaces available for walk-ins. See you there! JOIN US MONDAY EVENING FOR A LAST MINUTE HIP HOP MASTER CLASS WITH JANELLE & WILLDABEAST! One of their last classes before their wedding! Thank you for reserving your spot for the August 27th class with Willdabeast and Janelle! Please note that sales will be CASH ONLY at the door. Email info@klicktnyc.com with any questions. Master Classes with TRICIA MIRANDA & Workshops with JULIAN DEGUZMAN! We are excited to be promoting a new series: The PROGRAM! A series of Master Classes and Workshops leading up to a weekend event in Spring 2019! ONLINE REGISTRATION IS CLOSED. WALK-INS ARE WELCOME IN BOTH LOCATIONS. Please CLICK HERE to review the terms and conditions waiver prior to reserving your spot. If under the age of 18, parental consent is strictly required. NO REFUNDS, NO EXCEPTIONS. Credits can be used for future KLICK'T events. August 18 - NYC Location: Manhattan Ballroom Dance, 319 5th Avenue (corner of 32nd and 5th), New York, NY 10001. All Ages are welcome! Please note that material will be taught at an Int/Adv Level. Online Registration is CLOSED, Walk-ins are welcome. All Payments Must Be paid in CASH onsite. Sponsored by KOIN N CO DANCERS. FUSE Experience offers technique driven workshops and classes taught by some of the most sought-after choreographers on the scene. Train in musical theater, contemporary, hip-hop and commercially stylized genres with current working dancers, choreographers, and icons. Each instructor has valuable knowledge, tools and experience that our dancers need to learn how to become more successful in the industry. After a long season of competition, FUSE Experience provides participants with a non-competitive stress weekend that focuses on collaboration and mastery. Both key components to creativity. This is the perfect way to round out the season, and an inspiring way to look forward to the new! Join us for FUSE Experience's 1-Day Dance Intensive featuring faculty that are in the thick of the dance industry from commercial LA, NYC and on Broadway! Agency Mock Audition: opportunity to be scouted by a local talent agency, Q&A for parents and dancers about the industry. Audition Prep Class: Lane Napper incorporates acting and film techniques to prepare each performer for a film/stage audition. Group Discount and Perks like you have never seen! 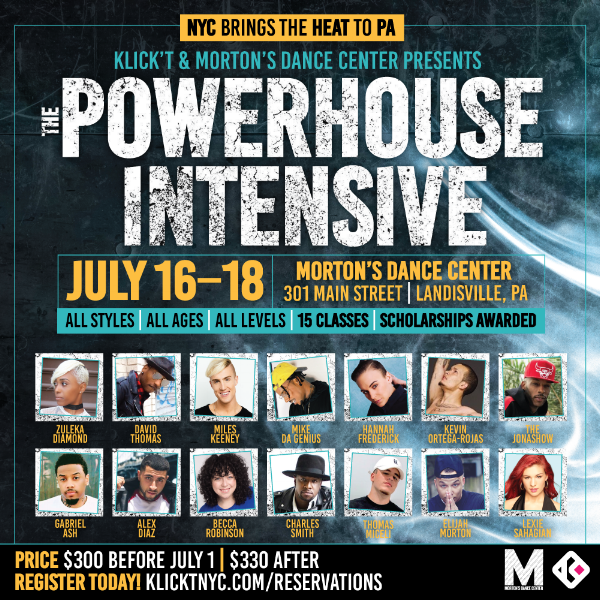 Join KLICK'T and Morton's Dance Center as we bring central PA the hottest teachers from NYC! You won't want to miss out on this amazing training opportunity. Please note that schedule is subject to change, and a more detailed schedule will be emailed to you prior to the event. We may alter where needed based on enrollment. Tuition covers participation in all 15 dance classes! Can't make it all three days? Individual days may be offered closer to date. Please email info@klicktnyc.com to inquire about single day options. JOIN US FOR A COLLAB CLASS with KLICK'T NYC! ONLINE REGISTRATION IS CLOSED. WALK INS ARE WELCOME! KLICK'T Hosts NEW Teachers in NYC! Join us as we welcome "Moose" from Step Up to the east coast, and dance with one of Jersey's own master teachers at KLICK'T for the 1st time! JOIN OUR MOVEMENT AS WE LAUNCH A PROGRAM FOR UNIQUE MOVERS OF ALL AGES AND ABILITIES! UNIQUE MOVERS uses a positive reinforcement approach to teach dance and movement skills to children and young adults of all ages and abilities. The mission is to spread the love of dance to those with developmental, physical, or behavioral difficulties in a more relaxed and inclusive dance environment. Our teachers at UNIQUE MOVERS are here to make each mover feel safe and inspired. Maggie, the creator, began working with children who have special needs at the early age of 12. Her passion for dance and helping individuals of all capabilities has become a very important part of her life. Being able to share her passion and love for dance with children and young adults of all levels, interests, and abilities is something she has always dreamed of creating. Dance is a gift that unifies all people at any capacity, and UNIQUE MOVERS strives to embody that concept! We are proud to announce that partial proceeds of this event will be donated to the Special Olympics. Thank you for helping us make a difference! Maggie has been immersed in the dance culture her entire life. Training includes The Alvin Ailey School, Broadway Dance Center, Peridance Capezio Center, as well as involvement in NYC based companies including the XY Dance Project and AbstraKT Beings. Professional Credits: "High Strung 2: Free Dance", the movie, "Best Days" Natalie Eve Lyons, music video, the Brooklyn Arts Performance Showcase, MOVES at NJPAC, REVEAL at the Sitnik Theater, and more. She is also an employee at Broadway Dance Center Children & Teens and Liberate Artists. Her experience with special needs children in dance and in her own family has propelled her to continue sharing her passion with all types of movers. She learned at a young age, the importance of inclusion in all areas of life. Dance has been at the core of her motivation, and with that motivation comes her desire to pass it on and give back! is a singer, dancer and actor whose goal is to inspire and spread love and peace to people of all ages through music and dance. Professional Credits: Broadway Dance Center Faculty, So You Think You Can Dance Season 8, American Idol, America's Got Talent, National Tour of "Hairspray", Peace & Love Music Festival in Sweden with Rihanna, and so much more! Robert can most recently be seen in the Broadway Musical "Spongebob Squarepants" as a singer, dancer and actor. is an acclaimed producer, choreographer, teacher, and performer. She is the Producer of The Young Choreographer’s Festival, an annual event in NYC presenting the most up-and-coming 18-25yr old choreographers, described by Dance Spirit Magazine as, ”The perfect way to get inspired.”. She teaches in NYC at Steps on Broadway, Joffrey Ballet School for the Ballet and Contemporary & Jazz Trainee Programs, Broadway Dance Center, and Peridance Capezio Center. Emily’s concert choreography (BEings dance) has been presented at Jazz at Lincoln Center, Joyce SoHo, Symphony Space, the 92nd St. Y, New York Moves, The Giving Tree Benefit Shows, The Showcase Series, The Choreographer’s Canvas, The Elan Summer Dance Festival, and Boston Contemporary Dance Festival, among others. is a professional dancer, choreographer, and teacher. Represented by MSA talent agency, he has worked commercially in both NY and LA. Professional Credits include: dancing for Silentó, Samsung, Jason Derulo, and Calvin Chen, as well as choreographing for Broadway Dance Center, The University of Auckland in New Zealand, The University of Virginia, and is currently a faculty member with Artistic Dance Exchange Convention and In Motion Dance Center of NY. Miles graduated in 2015 with a BA in Dance with a double major in Developmental Psychology from Connecticut College. He's developed a unique jazz funk style that pulls from his training in hip hop, jazz, contemporary, and modern. His classes leave his students feeling like they have channeled their inner superstar and tapped into a higher level of performance quality. Opportunity to be a part of a great inclusive first-of-its-kind event! Ready to Register? Tell Us About Your Mover! Please give us the name of the MOVER that will be participating in the event. Please provide the name of the MOVER's legal guardian or chaperone . Any Questions? Please feel free to write below! Thank you for beginning your registration for the UNIQUE MOVERS workshop on June 10th in Queens, NY. Please note that your reservation is not complete until payment has been processed. If you are ready to complete payment, please select the BUY NOW button below. Any questions, or for more details, please email Donna Sposato at Dspo35@gmail.com or call 203-464-9733. We would be more than happy to connect with you regarding your MOVER and how our event will provide fun, inspiration, and positive inclusion for all. LA & TORONTO > NYC! CLASS TIMES ~ individual classes available! Walk Ins are Welcome and All Sales Are Cash At The Door! Please Note: No Observers will be permitted for the 16+ Heels Class. Contemporary Jazz with Mollee Gray! ONLINE RESERVATION IS CLOSED. WALK-INS WELCOME!!! All Ages are welcome! Join us in welcoming Mollee to NYC as this is her first time teaching for KLICK'T. Lets show her some love east coast :) Class will be taught at an intermediate/advanced level. Please arrive by 6:15pm for a timely check-in and class start. This is a new studio rental location, please advise. Space is limited. Online Reservations Are CLOSED. Walk Ins are Welcome. ALL PAYMENTS MUST BE MADE IN CASH ONLY AT THE DOOR. All Ages are welcome! Please note that material will be taught at an Int/Advanced Level. Spaces are limited and not guaranteed. Email info@klicktnyc.com for any questions. Dance For Keke Palmer's MTV Performance! Online Registration Is CLOSED and the Master Class is SOLD OUT. *If chosen for the job at the audition, your first rehearsal begins that evening from 9:30-11pm. Audition is Open to the Public, and you do not have to have taken the class before to audition. However, choreography taught at the master class will be used for the audition. This is a PAID gig, and at SAG rates!! This event is Sponsored by Brooklyn FUNK! Master Class is open to All Ages (taught at an Intermediate/Advanced Level) may have some mature content. Note: The choreography that is being taught will be used in the audition. You do not have to attend the class in order to audition. Material will be taught at a very quick pace during audition. Audition is only open to 18+ (open to the public and is FREE). You do not need to attend the master class to be eligible. All rehearsals will be in Brooklyn, location TBA. You MUST be dressed in your outfit you plan on wearing for MTV at the audition. Dress to impress with hair, makeup and garments. Type casting will be a part of the selection process. All Ages and Levels are welcome. If you are young and advanced that's great; if you are older and a beginner, that's cool! Come dance with us! Check Out This NEW Location in BROOKLYN! Sponsored by Brooklyn FUNK! Please email info@klicktnyc.com with any questions regarding the classes. Online Resgistration is CLOSED, WALK-INS are Welcome! All Ages and all levels are welcome to each class. Please email info@klicktnyc.com with any questions regarding the class. George & Alonzo Master Class Series - Audition for Z ft. Tory Lanez! CASTING ALERT - Z ft. Tory Lanez Music Video in Miami! *Come take class and be eligible to be cast in the music video for Z ft. Tory Lanez (shoot to take place in Miami in early January)! Z is flying to NYC just to watch both classes to choose dancers! All Ages are Welcome: Note that the class will be at an Int/Adv level. PRE REGISTRATION IS CLOSED. We are accepting walkins! Cash only at the door for dancers and observers. See you there! Online Registration is closed. All payments must be made with cash at the door. All Ages are welcome! Please note that material will be taught at an Advanced Level. Online Reservations Closed - Walk Ins Are Welcome! Online Reservations are Closed - Walk Ins Welcome! Pre- Registration Is Closed. Walk Ins Are Welcome - Cash only At The Door. PRE REGISTRATION IS CLOSED, WALK INS ARE WELCOME! The dance space is sold out - but we are still accepting donations on the link below! Thank you to everyone who has made this an incredible movement! First 100 dancers registered recieve a FREE souvenier T-Shirt! Opportunity to be a part of a great cause doing what you love! Access to performances & presentations. Please note that schedule is subject to change, and a more detailed schedule will be emailed to you prior to the event. There are TWO Levels! Choose to dance in the Beg/Int Level or the Adv/Professional Level when you sign up online! Admission into the show will be donation based. All are welcome, and donations of any amount are greatly appreciated! Scholarships Provided by: Artistic Dance Exchange, Broadway Dance Center, Brickhouse NYC, KLICK'T, Koin & Co Dance Company and More! LAST MINUTE CLASS IN NYC!!! Ages 16+ - Hip Hop with Tricia! Please note that material will be taught at an Advanced Level. Please reserve your spot online here, but note that this class will be cash only at the door. Thank you!! Please note, that class will have explicit language and content, so each participant must be over the age of 16. Thank you for reserving your spot in Tricia's 16+ master class. See you at Adelante Studios on Sep 30 at 9:00pm! Your reservation is not complete until payment has been processed. Any questions, please email info@klicktnyc.com. Can't wait to have you in class! PRE REGISTRATION IS CLOSED FOR CLASS. WALK INS ARE WELCOME - CASH ONLY AT THE DOOR! SEE YOU THERE! Sign up with your email address to receive news and updates regarding master classes, tours, workshops, and more! We respect your privacy, and will not share your information with third parties. Thank you for subscribing to KLICK'T! You will be receiving updates regarding Master Classes, Workshops, Tours and More! Please add info@klicktnyc.com to your contacts to ensure that our newsletters are not put to spam. Thank you! ©Klick't 2016. All Rights Reserved.